The classic look of the Nokia 5230 makes it look more expensive than it is – although the side-loading SIM slot is just wrong. 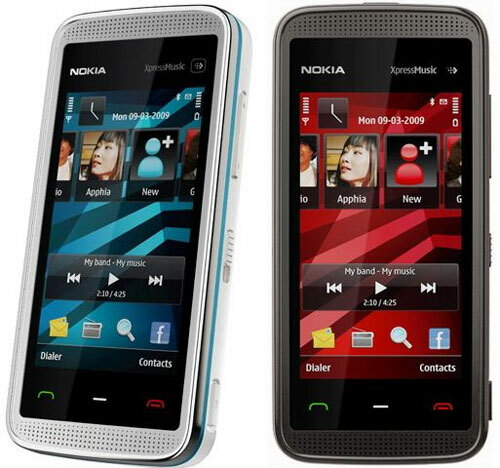 As familiar and easy to use as any Nokia handset with the exception of the frustrating and fiddly on-screen keyboard. The desktop-like Nokia Messaging and Ovi Maps 3.0 with sat-nav give this otherwise basic device a smartphone flourish. The usual Nokia simplicity and shortcuts make navigating a breeze, and the two-megapixel camera is actually rather good, but it is let down by Ovi Store, which really needs some improvement. The Nokia 5230 has Nokia’s familiar and simple user interface, its superb email functionality and Nokia Messaging, as well as a pretty good touch-screen. It also has a less-than-impressive on-screen keyboard, some daft hardware ideas and the uninspiring Nokia Ovi apps store. All in all, the 5230 is an average handset with strengths and flaws. The Nokia 5230 is a good touch-screen proposition for £150: a simple-looking plastic handset in white with a silver trim; a 3.2-inch touch screen – the same as on a HTC Hero – and a nicely rounded shape. While the touch-screen is resistive rather than the superior capacitive kind, it’s fairly responsive. Haptic feedback lets you know when your press has been registered with a pleasantly soft vibration. Below the screen sit three keys – call and call end, and a menu key that, when you press it, divides the screen like sliding doors to show all your programs. Nokia hasn’t let us down with the 3.5mm audio port, so you can plug in your own headphones. If you want a decent selection of music, though, you’ll have to shell out for a memory card – the 5230 has just 70MB internal memory. There is a side-loading SIM slot that just makes life harder. Not only do you still have to remove the battery to insert it – rather negating the point, we think – but you need something pointy to push the card in and pull it out again. If you change your card on a regular basis, this will soon be making you jump up and down in frustration. Finally, the unlock key is s springy slide key on the side of the phone which works well but sticks out a bit. The home screen is a scaled-down version of the usual Nokia S60 home screens, with one live notification bar for emails, a tool bar for four favourite contacts, and an application toolbar that you can customise but is set by default for Facebook, Maps, Sky Mobile and Ovi Store. There is 3G connectivity but no Wi-Fi, and while Sky Mobile does support 3G, it’s not as efficient as Wi-Fi for streaming video. We were timed out three times when trying to load Sky Mobile, and users of Ovi Store have rated the app just one star out of three. There’s no full HTML browser so mobile-optimised websites are loaded automatically. If there is no mobile version, the page takes a bit longer to load. The Facebook application is really good, giving you the full set of features, and the accelerometer means that when you turn the phone on its side, the screen orientation automatically changes to landscape. The jewel in the software crown is definitely Nokia Messaging, which gives you a desktop-like experience and a shedload of shortcuts. There’s support for up to ten email accounts that you can skip between easily. You can view your emails by subject, date, sender, unread, priority, flagged or attachment filters; and if you hold down on a mail in your inbox you get the option to reply, reply all, delete, mark as read, move or mark the email. It’s a shame that the excellent email capabilities aren’t matched by the on-screen keyboard. Typically for Symbian phones, it doesn’t allow you to type in the email field; you need to go to another screen with just the keyboard and a text box. Numbers and symbols are on a second keyboard screen, so not only is typing a drag, you can’t hold down on a key to get the alternative symbol like you can on BlackBerry and Android devices. The resistive screen is pretty slow if you’re a quick typist, missing a couple of letters from almost every word you type, and there is no auto-correct to sort it out for you. It all makes for a frustrating typing experience. If you hold the phone in portrait orientation, though, you get the old-style number keypad, with predictive text. It may well be faster to use. There’s been no improvement to Nokia Ovi Store, unfortunately. Out of several thousand items, most are themes and wallpapers, or pointless applications such as Fart Attack (Lite), which we can’t see being useful in any circumstance at all. The interface is also a bit rubbish, with tiny pixelated icons. But Ovi’s over-the-air backup system works well. Simply sign up at Ovi.com and your contacts and media will be backed up periodically, meaning that lost phones don’t necessarily have to mean lost information. It makes for easier upgrading too. The two-megapixel camera is surprising good considering its low resolution and lack of flash. Daylight photos look pretty good, and a range of modes such as night and portrait mean you even get fairly decent results in low light. A bonus feature is A-GPS and Maps 2.0, which you can upgrade to Ovi Maps 3.0 via Ovi, getting you access to free sat-nav, Lonely Planet and Michelin City Guides. The maps interface is simple and user friendly: you can view in 3D or top-down 2D, and have menu access to directions, current location maps and the weather. You can also save your home location so direction finding is a speedier process. Phones with some smartphone features are everywhere now, and Nokia does it very well, releasing basic handsets with a selection of smartphone flourishes at a price that won’t break the bank. The Nokia 5230 is an expensive-looking device with a nice touch-screen (except the on-screen keyboard) and a few fancy functions thrown in. Foremost of these is Ovi Maps, which add sat-nav and city guides to an otherwise basic handset. The Facebook application is good, and Nokia Messaging fully-featured and satisfying. This is a decent low-cost phone with enough extras to make it stand out from the crowd.